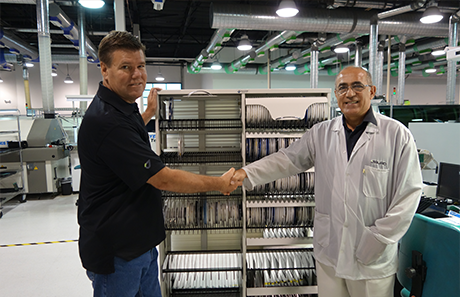 DEERFIELD BEACH, FL — August 2014 — Inovaxe, a world leader and provider of innovative material handling and inventory control systems, announces that Javad EMS (San Jose, CA) has purchased and received two Two Bay InoCart units, along with the Inovaxe InoView inventory/kit management software. Inovaxe provided installation and training with the Javad EMS team onsite. The Two Bay InoCart is material handling equipment that provides the benefit of Single Package/Single Location in varying sizes and configurations to be used in the stockroom and on the manufacturing floor. Inovaxe’s InoView software is an excellent tool for managing parts and kits within the stockroom and WIP. Part locations and kit requirements can quickly be identified with accuracy and traceability. For more information about any Inovaxe products or material handling solutions, visit www.inovaxe.com. Inovaxe Corporation is focused on delivering innovative production and inventory management solutions to the electronics industry. The Company’s product offering includes ambient air (InoCarts and InoKits) and Moisture Sensitive Device Material Storage Hardware (InoCartMSD), a Supply Chain Management System (InoVision), and an Inventory and Kit Management Software Tool (InoView). For more information and a demonstration of Inovaxe products, visit www.inovaxe.com. Javad EMS (JEMS) is a San Jose, CA-based EMS company that was founded with the vision of focusing on low- to medium-volume, high-mix applications for customers that need prototype through volume production and want to get it from one source. JEMS’ headquarters is a 40,000 sq. ft. state-of-the-art facility in the heart of Silicon Valley, updated to the highest standards of electronics manufacturing services, communication, client support, employee comfort and training. Today, JEMS is thriving and boasts four continuous flow SMT lines complete with inline 3D SPI and AOI. For more information, visit www.javad.com.